Getting all your groups on one page. Only merge accounts if they're for the same physical person. Both accounts need to have the same primary email address. Do not merge accounts if you and your spouse/child share an email address and need to respond to events independently. Note: Where there is duplication (e.g. if both accounts were invited to the same event), the most recent response will be used. IMPORTANT: A merge can not be undone. 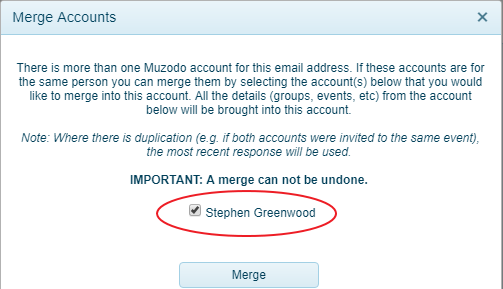 To merge, both your accounts must have the same email address. If they do, skip this section. Choose which email address you want to use. Log into the account of the other (non-preferred) email address. Open the 'My Details' tab. Update your email address and click save. Note: You'll receive an email with a confirmation link. Click on this link to complete updating your email. You will be asked which one, select either one. Click the 'Merge Accounts' button on the right. Tick the checkbox of the other account.